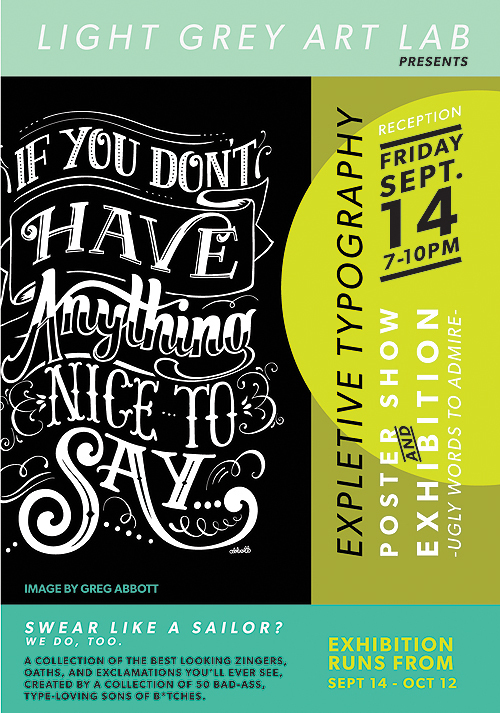 The Expletive Poster Show: Ugly Words to Admire is the next show here at Light Grey Art Lab, and it's one just for the grown-ups. A surly group of of typographers, designers and illustrators were given a simple instruction; celebrate their favorite cuss word, dirty phrase, or filthy mantra through art and type. The show opens Friday, September 14th, and we're throwing an opening reception from 7-10 pm! There will be dozens of lewd and crass posters, music that would make your mother blush, and plenty of good laughs! As an added bonus for you real bad mamma-jamma's out there, if you come dressed in an article of clothing that fits the theme of the show, we'll reward you with a special, one-night-only custom print! Tell your friends, but only the one's cool enough to appreciate a little salty language! Pass along our Facebook invite and we'll see you there! Remember, the opening reception is Friday, September 14th from 7- 10pm! We're located on the corner of Stevens Ave and 26th Street - right across from the Minneapolis College of Art & Design. Street parking is available on Stevens, 26th and 1st Ave.